Ecotones are transition zones that are often vulnerable to climate change. 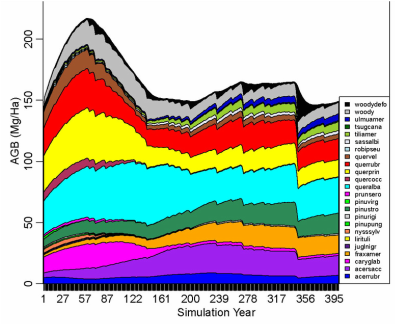 In temperate zones, I use the landscape simulation model, LANDIS-II, to predict forest change under different climate scenarios. To inform our simulations, we developed new geospatial methods using DEMs and Landsat imagery to quantify ecotone shifts. Our most recent findings revealed that montane forests in New England have not receded upslope as expected, but rather have expanded downslope over the past 27 years (Foster and D’Amato (2015) Global Change Biology). Derivation of ecotone study area subsets in the White Mountains, New Hampshire, USA. Changes in aboveground biomass (AGB) by species when gypsy moth outbreaks are simulated with LANDIS-II. Much of my research focuses on developing innovative quantitative tools from GIS, remote sensing and field data to examine forest ecosystem function. This includes developing methods for analysis of hyperspectral and radar data to map forest communities (Foster and Townsend 2004), disturbances (Townsend and Foster 2002, Townsend et al. 2012), and the biogeochemistry of forest canopies (Townsend et al. 2003). Hyperspectral image cube of Green Ridge State Forest, MD, USA. This type of imagery requires big data solutions. Tree-ring data help us understand past climate change, yet there is considerable confusion about appropriate statistical models to use when estimating future forest change (Foster et al. 2010 PNAS). Some of my current work seeks to clarify these issues. I used tree-ring data from 3000 mapped trees to reconstruct mortality and aggregate growth, providing insights that improve forest models (Foster et al. 2014 Oecologia). I collaborated with statisticians to develop Bayesian models of individual tree growth that account for both spatial and temporal autocorrelation. These models show that tree size and age account for more variation in growth than annual climate, a finding with significant implications for global vegetation and C-cycle models (Foster et al. (2016) Global Change Biology). Example of field plot, stem map, tree core sampling, and estimates of aggregate stand biomass increment from cross-dated tree-ring data.